The Japanese Goldfish is undoubtedly one of the best strains of colorful and high quality standard of crossbred goldfish. The Japanese have always been perfectionist in whatever they do and certainly this applies as well to their favorite pastime on keeping goldfish as a hobby. There are many popular strains being created over the years and some of these fish are only available locally in Japan while some are rarely seen outside the country. 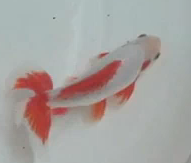 Let’s look at few examples of Japanese goldfish, which I’ve come across so far based on my own research into this topic. Presence of ranchu is pretty common nowadays in the United States and based on my own comparison between local ranchu and those found in Japan, there’s quite a notable difference in terms of coloration and development of fins. Those kept by Japanese goldfish enthusiast in villages are usually among the best strains that are highly prized after as a collection. 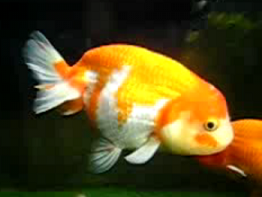 The ranchu are usually bred in ponds with slightly greenish algae water and the goldfish diet are strictly controlled mainly to focus only on live foods. 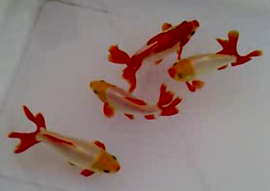 Culling is often used to get the best goldfish and to control the population so that more care can be given for particular selected few. In ponds, they also receive full sunlight exposure and with pure natural spring water, Japanese bred ranchu are often brightly colored with well developed thick fins and with nice curve and slope on their back. 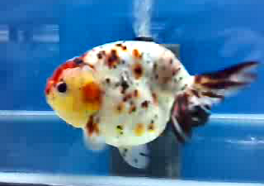 There is even a new strain of calico ranchu which is called edo nishiki in Japan and I found this to be one of the most beautiful strain ever produced with the right mix of black, orange and white coloration all evenly spread over the body. A close relative of the edo nishiki is another different variety called sakura nishiki with metallic scale and this one seems to be pretty rare. Both strains are actually similar to the ranchu in terms of body shape and what sets them apart is only on the body coloration.